Last night I decided to design a little cowl or neck scarf. Short, buttoned, relatively straight forward and with some left-over bulky yarn from a previous project. I found several balls in my stash. All about the same size, all the same weight. Good use of left-over yarn. So, while my sweetie was watching an odd (another odd) movie, I cast on my stitches and knit away. 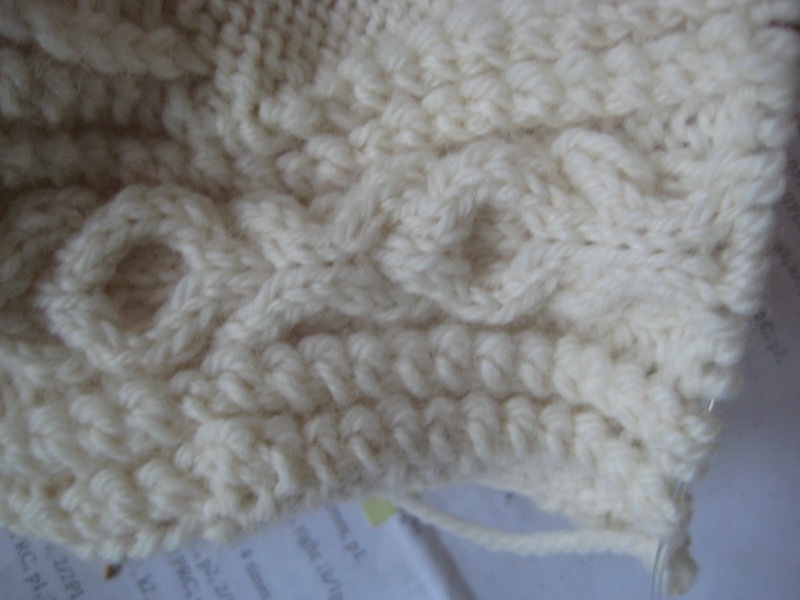 A couple of KT stitches and a 6-stitch cable down the middle. I was liking where it was going until the button hole row … and there was not enough yarn left to finish the couple of inches to the end of the scarf. I brought the other balls to the table and looked at them as a way to extend the scarf the two inches more that I needed to have a finished garment. Yeah, no. Yuck. Could I add a couple of inches in another color to both ends? No. Yuck. So, this morning, after sleeping on it, I frogged the scarf and will put the yarn away in my stash or donate it to a local elementary school for art projects. 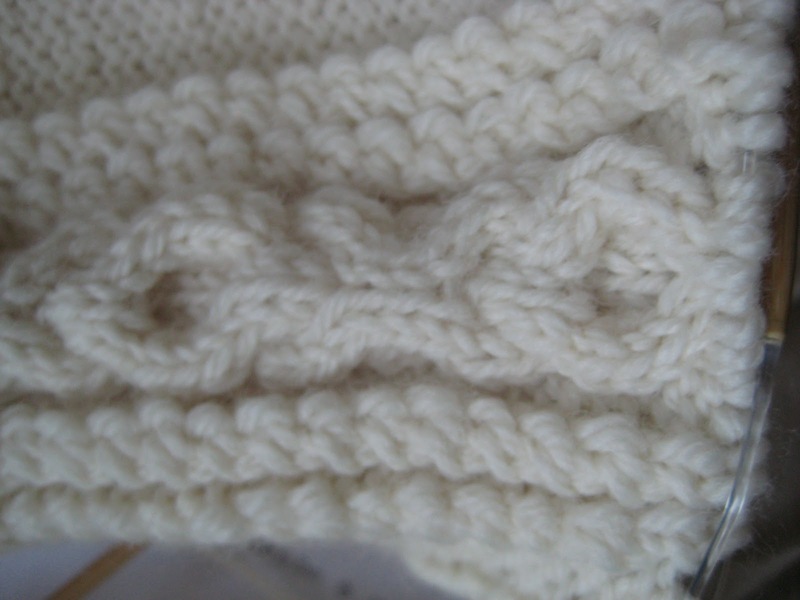 Here is a picture of the first cable pattern “A” (there are two “A”s and two “B”s to the project). Notice that there is an “O”, “X”, “O”, “X” and I’m ready to knit another “O”. Right? Here is a picture of the other side. The second cable pattern “A”. Notice that it is NOT the same. There is an “O”, “X”, “O” and I’m ready to knit an “X”. Now, I have to tell you. 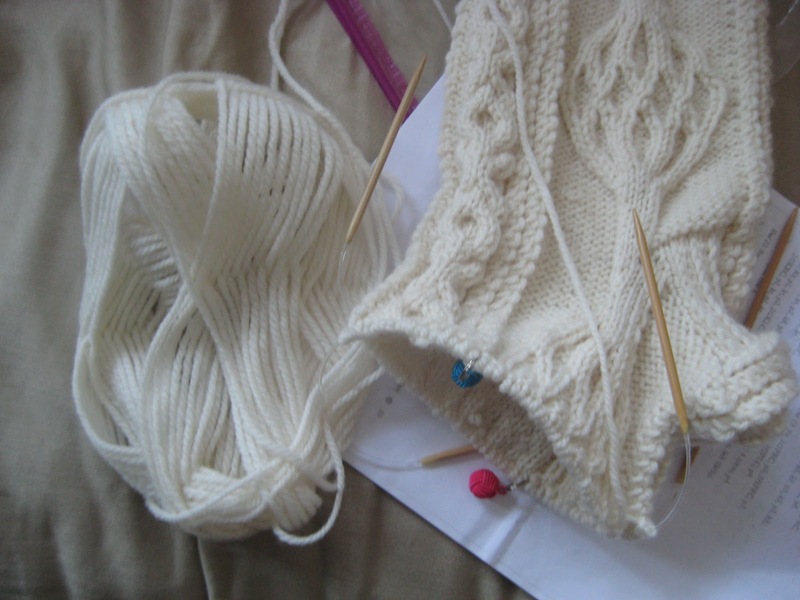 I love the Aran cables and I am an avid cable knitter. I have been counting every row throughout the two repeats of pattern “B” (which has 38 rows) and also (at the same time, mind you) counting every row of pattern “A” (16 rows). Good grief, as if that’s not enough?!!? Now, check this out … do you see how little yarn I have left? OMG! I have about 16 rows left and then the toe (I hope I’m not giving away too much information about what I’m making) and I have this stinking sinking feeling that I’m going to run out of CLEAN yarn. (Remember this is the project that wore coffee in it’s first iteration and then I noticed the mistake that I had made and consequently frogged it and started over with new clean yarn?!?! Guess who will NOT be frogging again? Now I know why I always buy too much yarn for every project! Knitting is not supposed to be stressful!